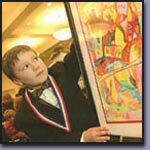 Internationally recognized Youth Artist, Adrian Jellinek, comes from a long family tradition of artists. He has been painting for over four years. He is also a children’s book writer and member of I/ACT. His artistic achievements have been highlighted in many press releases; he received the Incredible Kid Award 2007 and Reading Rainbow acknowledgments, along with numerous high honors for his mastery of the arts. Adrian likes to work with a wide spectrum of colors and also continually experiments in new mediums. A professional artist needs to know how to "finish the job", so Adrian has also learned how to frame his own artwork. Original artworks by Adrian are collected in places as far away as England. Adrian is an example of the many talented youth artists in Troy. Adrian's artwork was on display at the Troy Public Library from October through December, 2007. 2010 Update: Adrian now also has his paintings on exhibit in England and Belgium. He has also submitted paintings for Royal Oak Michigan's Arts Beats and Eats Festival.